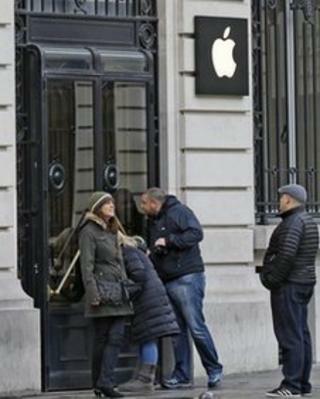 Armed robbers broke into a central Paris Apple store on New Year's Eve, stealing goods with an estimated value of one million euros (£813,000). The police said that four masked men forced their way into the shop. It comes as New York mayor Michael Bloomberg claims that the theft of Apple goods has contributed to rising street crime figures in the city. The Metropolitan Police told the BBC the trend towards stealing gadgets was "significant". Thieves broke into the Apple store behind the Paris Opera at around 21:00 (20:00 GMT) on Monday, three hours after the shop closed. The police did not confirm the value of the goods stolen by the robbers, who escaped afterwards in a van. A spokesman for the police union Unsa told reporters: "As the majority of police were busy watching the Champs Elysees [for New Year's Eve celebrations], the robbers took advantage of this opportunity." The theft comes as the desirability of Apple goods among street criminals is being blamed for a rise in crime figures in New York. According to the New York Police Department, some 3,890 Apple products were stolen in 2012, pushing crime figures up and prompting Mayor Bloomberg to say that thieves in the city were showing a preference for Apple goods. His press secretary later said that if the jump in stolen Apple products was removed, crime figures would have been down for the year. According to London's Metropolitan Police, street criminals in London are increasingly targeting easy-to-steal gadgets, although they do not provide a breakdown of the brands most favoured by thieves. "In general the more you paid for a gadget the more interest it will be to street robbers," said a spokesman. "We are constantly reminding people to register their goods," he added. What police have seen, he said, is a change in the profile of victims as thieves become less likely to steal cash and more likely to steal phones which are "highly sellable on the second-hand market". "Victims now are far less likely to be a bashed-up pensioner and more likely to be a young professional who has had a phone grabbed out of their hand or pocket," he said. One of the most high-profile Apple store break-ins in the capital was a smash and grab at Apple's flagship Covent Garden store in October 2011. A gang of motorbike thieves broke into the shop, stealing up to £75,000 worth of goods. Two men were later convicted of robbery.